Zee TV has been promoting new and different perspective to the Indian TV audience with its variety of TV shows over the period of time. After offering different programs, they have now dipped into the supernatural theme and are offering and are offering new show Manmohini. It centres around the supernatural theme and portrays the romantic horror storyline. It is produced by Prateek Sharma with his LSD films. They are also the makers of Ek Deewana Tha that is run on Sony TV. 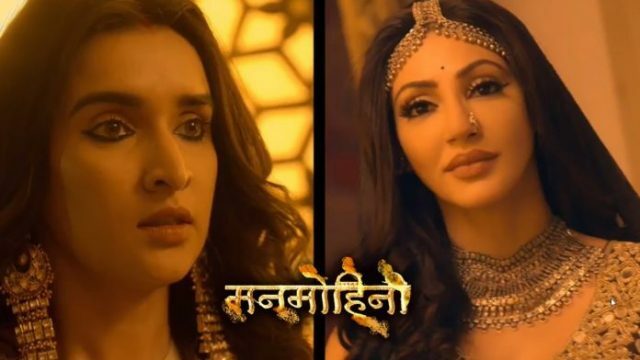 The latest episode update 23rd January 2019, begins with Mohini stops Ram from crossing Berhampur’s border seeks her friend Chakua’s help but she unable to do. Chakua chudail enters sitting on the car bonnet. Mohini happily tries to hug her, but she stops her and begins her overacting. Mohini replied that she is happy to see her. Chakua said why she is making too much drama, she had given her number to Sheela to pass it on, she knows how much traffic is in Chudail land and continues boasting about herself. She needs to bring him back for her, Mohini said that Ranasaa has left Behramgarh. Chakua said she will be brought Rana Saa back and she needs something in return of this. Mohini asks what? Chakua gives her agreement papers and asks a question to sign them. Mohini replied she can give anything for Ranasaa and signs papers. Chakua turns into the paper kite and Mohini files her. After this, she files and falls on Ram and Siya’s car and starts dancing on the song Chikini Chameli. Then she looks at Ram and thinks he is so hot, Berhampur’s Siddharth Malhotra and continues eyeing on Ram. After all this Siya plays old romantic songs. Chakua thinks that she is listening to these songs since centuries and plays Chikni Chameli song. Siya tried to change the song but Ram stops her and said it is energetic like his wife. Upcoming written episode 24th January 2019: Siya runs in Jungle. Chakua thinks Sautan will fall into the pit and holds her mouth from behind. Ram reaches there, but cannot see Siya.